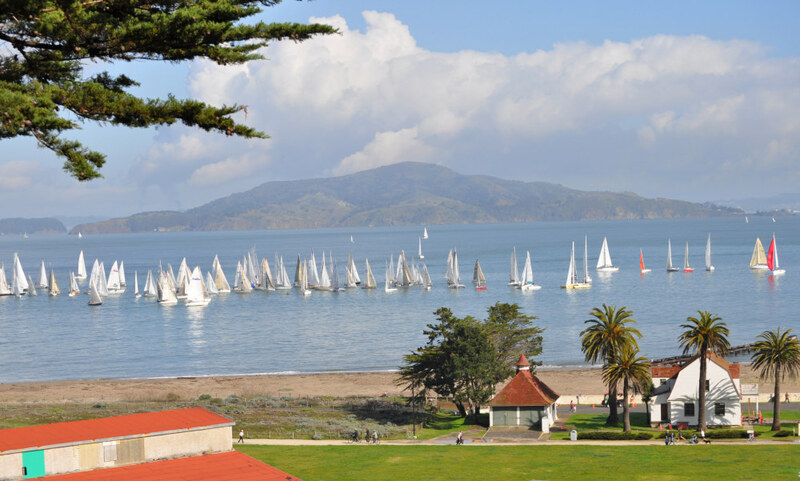 What’s up at the Golden Gate Yacht Club with barely a week to go before their trimaran hits the race one starting line at America’s Cup 33? A fiasco, but in this case a fiasco of the finest sort. The GGYC start/finish line over the weekend was used for the biggest sailing event of the year on San Francisco Bay, the Three Bridge Fiasco. 359 entries (!). I’m not sure yet how many boats actually started, but the relentless winter rain relented, and some people made the right choices and some did not. 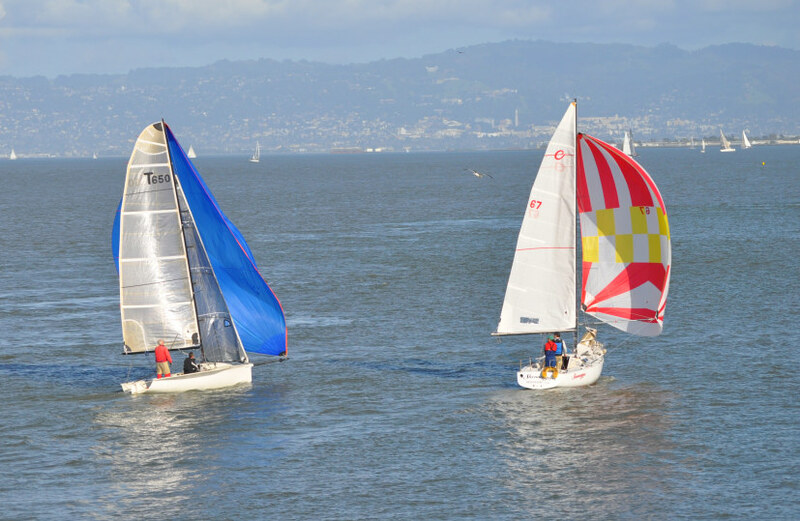 The point of the event is to round marks at three bridgesthe Golden Gate, Bay, and San Rafael bridgesin any direction and any order, in either doublehanded or singlehanded divisions. 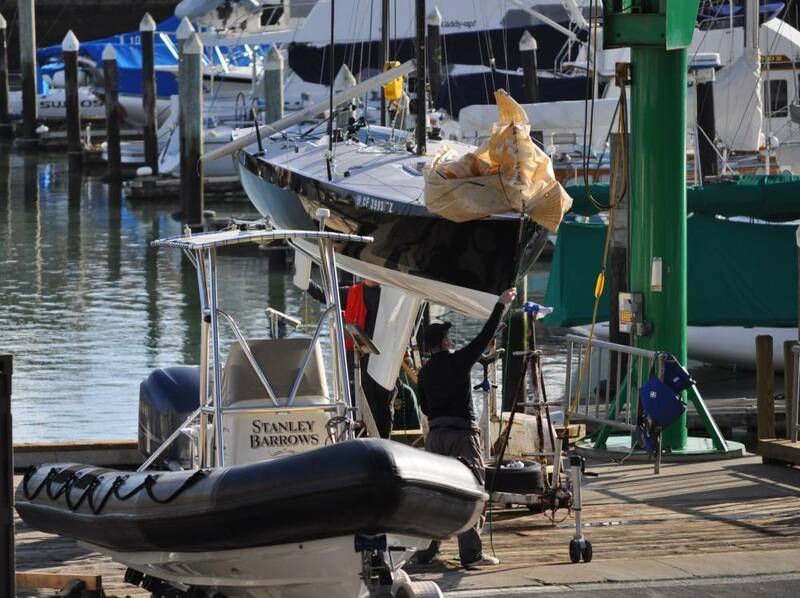 With a ripping ebb tide peaking at 5.8 knots, you knew there would be big winners and big losers. They do call it a fiasco, after all. Per usual, a Moore 24 came in first, and that would be Scott Easom’s Eight Ball, followed by the two boats shown above, Ben Landon’s T650 Flight Risk with Mark Adams driving, and Nick Gibbens’ Express 27, Shenanigans, with Dave Gruver trimming spinnaker. They were on the last leg, crowding the beach for tide protection, with the T650 ahead and going faster all the time but sailing hot to accomplish that, covering a lot more distance and getting too far out into the current so that they came back together, ah, together . . .
And closed on the finish quite together until Flight Risk gybed away. That’s the Golden Gate Yacht Club at the right of the pic . . . 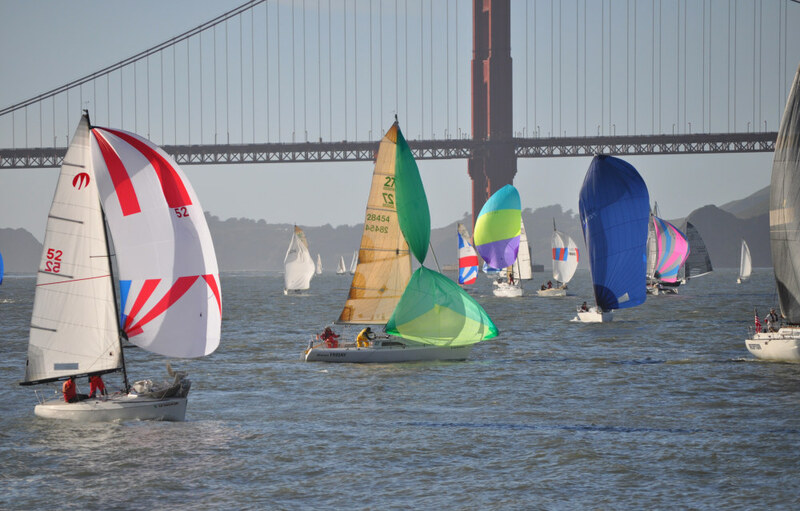 The Singlehanded Sailing Society of San Francisco Bay puts on the Fiasco, and they had preliminary results up on Sunday evening. It turns out that Shanigans made some unfortunate assumptions about their start time and incurred a twenty-minute penalty, so all this nose-to-nose stuff was just for fun. And so is this writing, btw. This little exercise isn’t meant as journalism per se, more as a sort of extended Facebook posting. Nearly an hour after the leaders it got crowded . . .
By then, Eight Ball was home and almost dry . 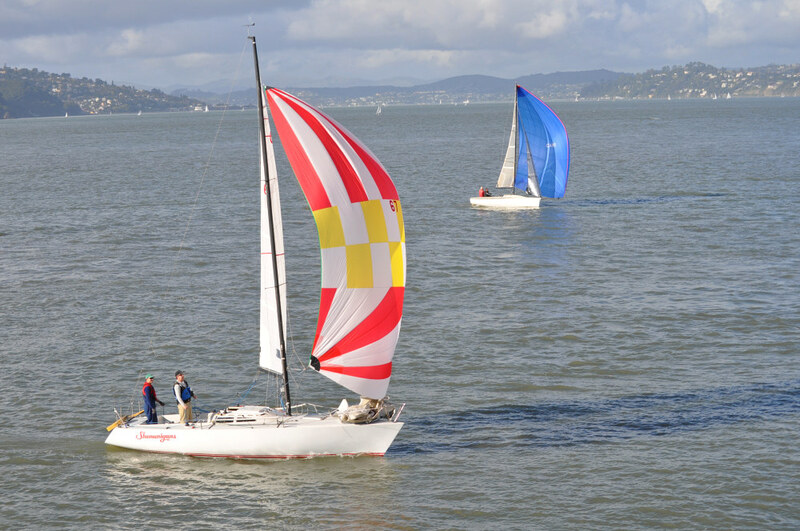 . .
GGYC commodore Marcus Young was out there in the Fiasco somewhere, and while we’re not exactly on the subject, let’s turn and tip our hat also to the big losers, the many who tried to go clockwise starting with the Blackaller Buoy at the Golden Gate Bridge. Think light wind, a building ebb, and the whole pack seeping seaward while trying to sail bay-ward. They were saved when the breeze increased, but not saved enough to threaten the many who went the other way first . . . Elsewhere, it was Opening Day at the Los Angeles Yacht Club, an Open House day at Alinghi, and the UAE announced that they are ready to permit VOIP. Now you know.